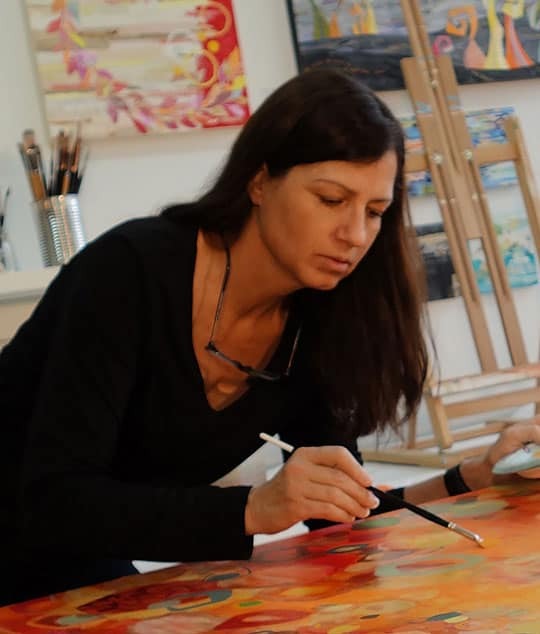 I have moved my art studio many times over the years, and I would love to share a few tips I’ve learned. The less you have to move, the easier the move becomes. I’ve found the longer I’m in a location, the more stuff I accumulate. After a while, my piles of stuff become overwhelming and make my studio mostly unusable. Over the course of many moves, I’ve forced myself to become more selective about what I keep to help reduce the clutter. I start by ridding myself of a lot of my old paintings. I am happy to say my work has improved over the years and much of my earlier art isn’t up to my current standards. Now, I only save the professional pieces that I’m not embarrassed to show anyone, plus a handful of earlier pictures of which I’m particularly fond. As a result, I have a pretty streamlined collection of my work (with just enough old stuff for that museum retrospective I plan to have when I’m 90). So what to do with this work you’re not keeping? Have a moving sale offering your older work at a good discount. Someone gets your work at a great price, and you have lightened your moving load. Win/win. Gift your work to friends, charities, and other places (hospitals, retirement communities, etc.) that might like some free artwork to hang on their walls. Throw it away. Or have a bonfire party where you and your artist friends can purge their unwanted artwork as a cathartic way to start fresh. Next, I cull the materials I don’t use. During my MFA, I experimented with all kinds of mediums that I’ve never used since. I went through and sorted what I use from what I was keeping out of some mistaken thought that I might one day use them. Ground pumice, carborundum grit, silk screens, linoleum tiles, & rabbit skin glue (I’m a vegetarian for heaven sake!) Yep…time to give that stuff away. I like to pack my art supplies myself (and purge as I go). The key to making the packing go quickly and smoothly is to NOT skimp on packing materials. Don’t use old, worn shipping boxes as they are generally too thin to protect your supplies. Instead, purchase the heavy-duty cardboard boxes, packing paper, and bubble wrap. Don’t over pack your boxes, cramming your materials together without padding. Instead, wrap your supplies well, and add extra padding around the bottom, sides, and top of the box. If it’s important enough to transport, it’s important enough to pack it well. Home Depot has very affordable supplies, and you can return any unused purchases so buy more than you need to eliminate unnecessary extra trips to the store. I have personally packed, loaded, moved, and unpacked my studio by myself several times. It’s time-consuming, back-breaking, and I end up with lots of bruises and smashed fingers. I’ve realized that it’s better to leave the physical lifting to the professionals. It may seem expensive, but I’ve never once regretted the added expense. With pros moving my stuff, I don’t run the risk of injuring myself trying to carry studio furniture that weighs more than I do down a flight (or three) of stairs. Plus, movers are faster than I ever could be at the job. Seriously. During this recent move, they had ALL my stuff including a massive table, two flat files, and heavy wooden easel loaded in the truck in less than 30 minutes! If you are moving locally, move your most fragile stuff yourself. I have pastel sticks that break if you sneeze on them and unframed paper works that need special care. I prefer not to let the movers handle these more delicate items. Instead, these things come with me in my car to my studio’s new location. I can treat them with child gloves, and if anything gets damaged, at least it was by my hands. Somehow, it makes damaged work easier to bear. Most movers won’t deal with your chemicals. Plus, the last thing you want is for a container of turpentine to suddenly start leaking in a box. It would expose the crew to harmful fumes, it’s flammable, and could potentially damage your property stacked up around it. So what to do instead? If headed out of town, get rid of as much as possible to another artist or hazardous waste site. If you are moving locally, make a separate trip using your car. While not exactly the most optimal thing having a box of chemicals packed in your vehicle, it’s probably no more dangerous than your full gas tank. Seal everything in plastic bags, packed with copious amounts of packing materials, and drive carefully. 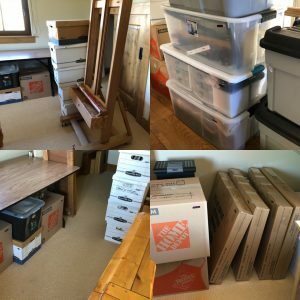 Do you have some moving tips from your studio move? Please share them in the comments section.